It’s October so that means its Autumn and that means conker competitions, discovering your favourite jumper has been eaten by moths over the summer and at the very end of the month Halloween! Halloween is one of the “liminal” times of the year when the spirit world can make contact with the natural world and when magic is most potent. We all know that ghosts can be naughty, so just imagine what they get up during the “liminal time” but there is a way of keeping them at bay…glow in the dark pumpkins! So we thought it would be kind of cool to have a pumpkin carving competition. The rules are simple, as many entries as you want, entries via email to johannes@omlet.co.uk and photographs should include a shot taken at night with full glowing effect. Deadline is midnight on October 31st and the winner will receive a £20 Omlet gift voucher to spend in the Omlet shop. Several Omlet employees will all be entering too so expect competition to be fierce! Thanks to Clare and Kate who helped at the Autumn show in Ardingly last weekend. It was a marvelous show because quite unexpectedly one of the last One Man Bands left on the planet appeared on the Omlet stand where he delighted the crowds with a rendition of Chick, Chick, Chicken lay a little egg for me. Those of us who were lucky to be there will remember it forever! I check my girls over regularly for skin parasites and have avoided them….until now. My hens are all used to being handled which makes checking for lice and mites really easy. 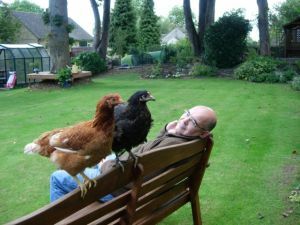 I hold each hen with one hand and carefully ruffle the feathers against the direction they grow in to see if I can spot anything scurrying away. The hot spots to check are round the neck area, under the wings, the abdomen, breast and around the vent. Last weekend, I spotted one or two tiny beige discs the size of pinheads on some of the neck and belly feathers and as I watched them, they moved! All of the hens have now had a really good dusting with louse powder which I’ll repeat in a week to catch any eggs that have hatched out. Red mites are the most dangerous because they don’t actually live on the birds, preferring to hide in cracks and corners of the hen house. They come out at night and feed on the blood of the birds and can cause anaemia (often a sign is a pale pink comb) and lethargy. Sometimes you will realise that you have a red mite problem if you can see a whitish powder at the ends of roost bars or tiny blood spots on eggs. Luckily the eglu doesn’t have any difficult to get into crevices so doing a thorough clean out is possible. You can then treat with a red mite spray or powder which is now available in the Omlet shop. Northern Fowl Mites are similar to Red Mite but live on the birds and leave dirty dull looking patches on the feathers and leave the hen depressed and miserable. Scaly Leg Mites burrow under the leg scales and cause horrible irritation. This is easy to cure by dunking the legs one at a time in a jar of surgical spirit or smearing the legs with a thick layer of Vaseline. Be vigilant as a parasitic infestation can make your hens feel really miserable and can even stop them from laying eggs – a scenario definitely worth avoiding! 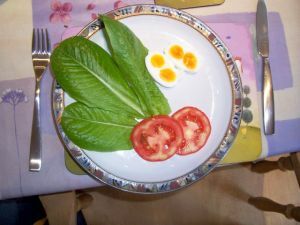 Forum members offered some good advice to get the faddy ladies eating properly! As a chicken expert (ha ha) of 4 months I have found chickens to be exactly like children rufusing to eat what is good for them. When my girls first arrived I couldn’t wait to give them extra treats, mostly to get them used to me and tame. One day I would give them sweetcorn, the next grapes and oh tomorrow we are having curry and there will be rice left. In the end I realised that they were not eating their pellets but waiting for their afternoon treats because treats probably tasted nicer than the pellets. Well I have now stopped this. For one week they only got pellets. 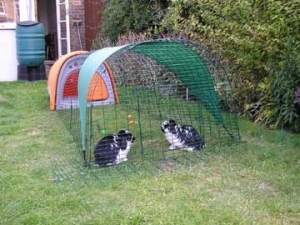 They didn’t starve to death because they soon realised pellets was all they were getting. Now I give treats two or three times a week. I hang greens for them everyday. 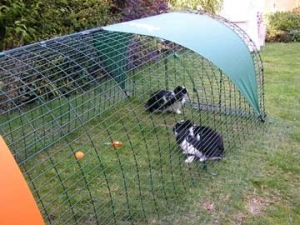 (my girls do not free range in the garden, but they do have a large run). What pets do you have? 9-month old Parson Russell terrier, Sydney Dylan. If you were stranded on a desert island what luxury item would you have? chocolate and Jelly Bellies. What breeds are they? Pekin bantams – silver partridge and porcelaine – beautiful! What are your chickens called? Sybil and Margot. How many eggs do you get a week and what is your favourite way of cooking them? On strike at the moment – we’ve had about 30 eggs from them since April. Favourite way of cooking them is eggie bread or in cup cakes. Do your chickens have a party trick? Eat single seeds from my fingers, sitting on my knee – only Sybil though. Margot’s having none of it. Sybil’s also good at pecking our puppy. They also answer back when spoken to and perform the most fantastic two-footed bounce. item would you have? A pillow! What are your rabbits favourite food? Spring Greens! Each week we will be featuring an elguowner of the week. If you would like to be featured then read our questionnaire here and email your answers to james@omlet.co.uk . Chicken spice (Poultry Spice) is a mineral supplement to keep your chickens in tiptop condition. You might give this to your chicken if it is moulting or help it maintain a good appetite. It shouldn’t to be confused with that musty old scent – Old Spice or something you rub on your Sunday roast to make it taste better. You can give 1/4 teaspoon of this mixed into the layers pellets per 2 chickens.